A hipster is someone who goes against the mainstream and doesn’t conform to societal norms. Here are some fonts that we think are perfect for your next hipster project, but we aren’t excited about it because it’s not very hipster cool to be excited. We rounded up 20 hipster fonts for your enjoyment. This post is sponsored by The Hungry Jpeg, our favorite resource for purchasing fonts! We always recommend them because they have great prices, great licensing agreements and great customer service. They are the best deal around! When you buy a bundle the fonts often end up to be only a few pennies each, or you can’t beat the dollar section when you just need one on the fly! You can check out the most recent font bundles here! They are safe! When you buy from a well known source and pay the designers for your work, it is highly unlikely you will contract a computer virus or other form of malware from the download. This simple font is the perfect unassuming font for any project. It would look great on a storefront or as a menu. It would also be nice on a tote or t-shirt. I mean the picture for this one says it all. Could it be any more hipster? This simple handwritten font is great for adding a little character to your project. This would make a great font for your signature on your handmade goods. This is a really fun and unique font. The sans version is all in caps and is not the standard proportion of letters. The A and R for example have most of the letter up top and the bottom is sort of short and stumpy. Whether or not that is a great explanation the font is super fun and it is one of our favorites! This is a simple but beautiful font without lots of bells and whistles. There isn’t much better for your hipster project than a simple font that adds a personal, but not fussy, touch. This is a really pretty font. It has some flourishes but nothing gaudy or over the top which makes it the perfect “fancy hipster” font. It isn’t overly busy but it has just enough. When you have a simple message to get across sometimes a simple font is the best route. This font is straight to the point. It looks nice and won’t detract from what you are trying to say . Use this for posters and mailers for a great effect. Again, the guy in the background with the beard, hipster alert! 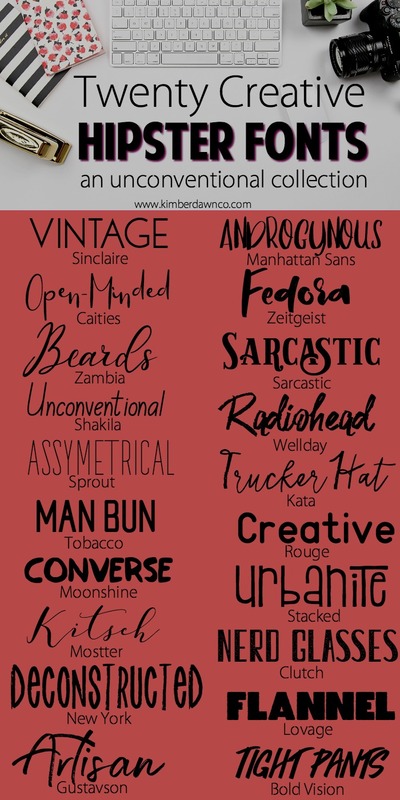 Plus they call this font “handcrafted” which couldn’t sound more hipster! This is another great one for you handmade project labels or store front. Bring me my nerd glasses while I pretend that I hand painted this font 😉 Isn’t is so nice though in all seriousness? The aged version of this font has just enough vintage in it to satisfy my hipster sensibilities. The uneven look of this font makes it really fun and unusual. It has that hand painted look without the fancy and technical hand lettered feel. This one fits just for the name, but it is also a simple and basic font that is great for all of your hipster needs. This is a great casual font that is just one step above your basic font. This would be perfect for adding a logo to a menu or product tag. This font looks like it was scrawled in a quick moment and that makes it totally approachable and not overly fancy. It is great for printables and memes. The name of this one says it all. Use it in those clutch moments when you want to make a strong point and add some passion. How very hipster this font is! Vintage, with a touch of pop. I kind of want to make a shirt so I can add this as a label. What a fun idea! This font feels like you grabbed a poster marker and tagged the wall. It is so fun and just screams act now! There is just something that I absolutely adore about this font, I just can’t exactly put into words what it is. What do you think? Is it love at first sight for you too? Hipster picture alert! This is another simple but beautiful font that would be perfect paired with one of the handwritten/handpainted fonts above. This font is actually super fun. It has lots of options and variations where you can literally stack the letters for a different look. It really speaks to the creative side of my brain! This last one is another that looks like a poster marker and I love that look. It would look great on a t-shirt or tote bag! Which of these hipster fonts do you love? Share with us in the comments below.